Ayia Napa has been transformed from a sleepy fishing village into a lively resort that has something for all ages and contrary to popular belief, this cosmopolitan town isn't all about bars and clubs for the younger generations. If you look closer you will discover that Ayia Napa is full of history and tradition, impossible for even the fussiest of visitors not to find something that would interest them. The center of the town is built around a medieval monastery. Surprisingly this has been well preserved over the many centuries and a visit here is like stepping back in time. Just to the side of the main square, traditional folk dancing takes place during the summer. At the end of September the Ayia Napa Street Festival takes place with singing and dancing performed for anybody that wants to watch. Special acts from all over the world are brought to perform at the festival (in 2001, River Dance came to Cyprus and the show was performed in front of thousands of spectators). One of the most beautiful locations to visit in Ayia Napa is the fishing harbour. Much money has been invested over the last couple of years to revitalize this area. The results are amazing!! The entire harbour has been pedestrianised with cafes and fish-tavernas lining the area. A wooden walk way spans the length of the harbour and continues past it. At night, beautifully designed lights light up to illuminate the area, setting the perfect scene for a romantic meal or a stroll along the harbour watching the moon float over the sea. Discover Ayia Napa. You will be surprised! 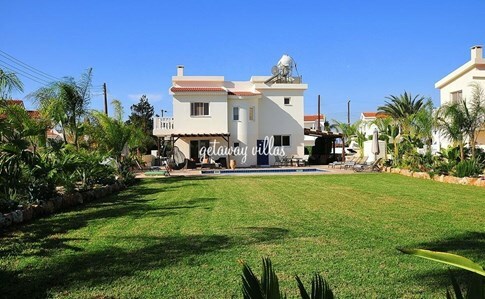 Stay in one of our villas just outside Ayia Napa and enjoy what the region can offer.